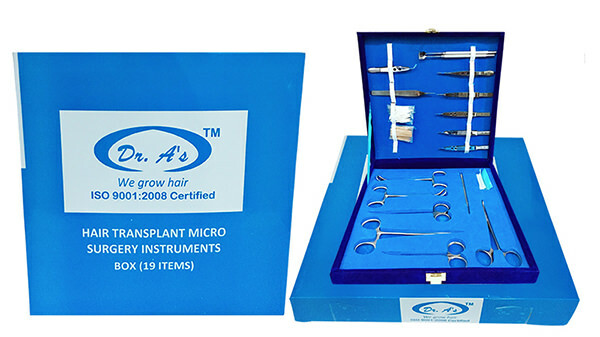 The most comprehensive Hair Transplant Kit used by us Now available for sale. If you think you or someone you know may benefit, then please contact us at [email protected] or call us 1800112343 to place your order with inaugural discount ... this is our 21-year celebration and on this occasion this is our gift to doctors wanting to perform hair transplant the correct way. Does that come with instructions? The e-observership comprehensive hair transplant course is separate. This KIT provides all instruments used in Dr. A's FUSE technique, that enables us to provide amazing results (with virtually no visible scars even when grafts are extracted from the beard - cheek area) and give dense and natural results in the recipient area. I have a flier from a UK clinic going back several years on robotic FUE It was a promotional event trying to drum up business. More importantly they offered a separate deal on how anyone can turn their clinic into a million dollar operation based on what to say to potential clients. You know tweak the customer a little by playing on their emotions. Is this part of the package or is it strictly tools and here's how you do the procedure? Something like this is how we close the sale type deal. Yes, these are strictly tools (no robots or hype of any kind). About how to do the procedure, doctors can access our e-observership course and, thereafter if any doctor wants, they can come and learn hair transplants correctly by seeing a wide range of patients being treated (repair, temple point creating, designer hairlines, beard and body hair to scalp). This way they get a vast amount of practical knowledge before they start their practice. It will take months of training, just like the LA based doctor who visited us and got a complete experience instead of 2 day workshops or youtube. (no robots or hype of any kind). Good to hear you are not about the hype.